American family, well known in Georgia, members of which are at present living in Savannah. American merchant; born in England at the beginning of the eighteenth century; died at Savannah. He was one of forty immigrants who arrived at Savannah in July, 1733. He left two sons, Levi and Mordedai. 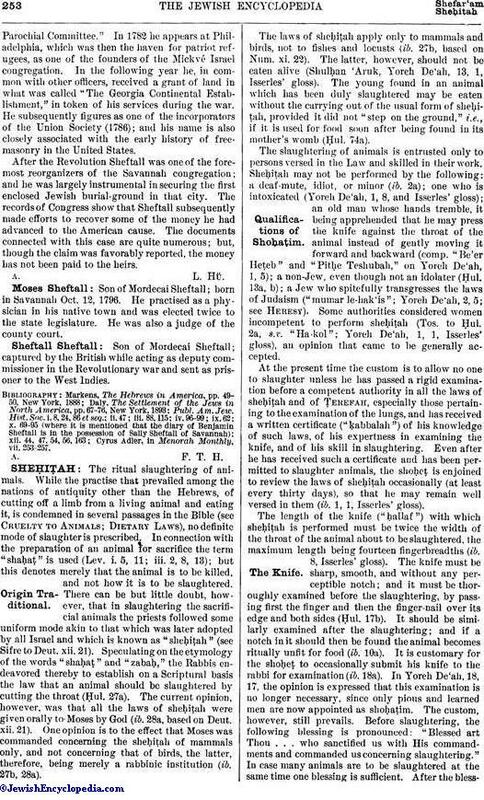 Benjamin commenced the well-known "Sheftall manuscript," completed by his son Mordecai, in which the immigration of the Jews to Georgia in 1733 is described. He was known for his antislavery views, and was one of the founders of the Union Society of Savannah. His eldest son, Levi, was a merchant in Savannah, and held, like his father, a leading place in the affairs of the Jewish congregation. American soldier, and patriot in the Revolutionary war; born at Savannah, Ga., 1735; died there 1797. He was one of the first white children born in the colony, being a son of Benjamin Sheftall, who arrived in Savannah shortly after Oglethorpe, and whose name is mentioned in the first deed of Georgia. Mordecai received a fair education, and, on attaining manhood, became a prominent merchant. Long before the Revolution he was a member of the well-known Union Society. For several years the only Jewish place of worship in Savannah was a room fitted up by him in his own house, where services were held until about 1774. In 1773 he deeded a piece of land to his coreligionists for the purpose of erecting a synagogue; but the project was abandoned owing to the excitement preceding the troubles with Great Britain. 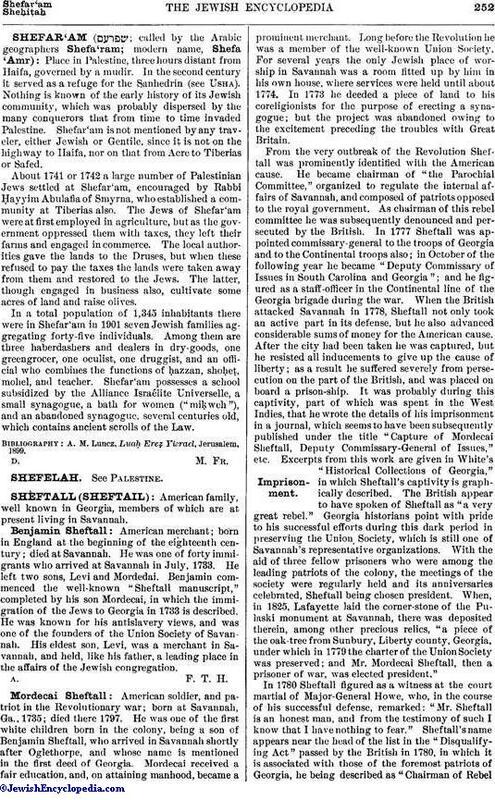 From the very outbreak of the Revolution Sheftall was prominently identified with the American cause. He became chairman of "the Parochial Committee," organized to regulate the internal affairs of Savannah, and composed of patriots opposed to the royal government. As chairman of this rebel committee he was subsequently denounced and persecuted by the British. In 1777 Sheftall was appointed commissary-general to the troops of Georgia and to the Continental troops also; in October of the following year he became "Deputy Commissary of Issues in South Carolina and Georgia"; and he figured as a staff-officer in the Continental line of the Georgia brigade during the war. When the British attacked Savannah in 1778, Sheftall not only took an active part in its defense, but he also advanced considerable sums of money for the American cause. After the city had been taken he was captured, but he resisted all inducements to give up the cause of liberty; as a result he suffered severely from persecution on the part of the British, and was placed on board a prison-ship. It was probably during this captivity, part of which was spent in the West Indies, that he wrote the details of his imprisonment in a journal, which seems to have been subsequently published under the title "Capture of Mordecai Sheftall, Deputy Commissary-General of Issues," etc. Excerpts from this work are given in White's "Historical Collections of Georgia," in which Sheftall's captivity is graphically described. The British appear to have spoken of Sheftall as "a very great rebel." Georgia historians point with pride to his successful efforts during this dark period in preserving the Union Society, which is still one of Savannah's representative organizations. With the aid of three fellow prisoners who were among the leading patriots of the colony, the meetings of the society were regularly held and its anniversaries celebrated, Sheftall being chosen president. When, in 1825, Lafayette laid the corner-stone of the Pulaski monument at Savannah, there was deposited therein, among other precious relies, "a piece of the oak-tree from Sunbury, Liberty county, Georgia, under which in 1779 the charter of the Union Society was preserved; and Mr. Mordecai Sheftall, then a prisoner of war, was elected president." In 1780 Sheftall figured as a witness at the court martial of Major-General Howe, who, in the course of his successful defense, remarked: "Mr. Sheftall is an honest man, and from the testimony of such I know that I have nothing to fear." Sheftall's name appears near the head of the list in the "Disqualifying Act" passed by the British in 1780, in which it is associated with those of the foremost patriots of Georgia, he being described as "Chairman of RebelParochial Committee." In 1782 he appears at Philadelphia, which was then the haven for patriot refugees, as one of the founders of the Mickvé Israel congregation. In the following year he, in common with other officers, received a grant of land in what was called "The Georgia Continental Establishment," in token of his services during the war. He subsequently figures as one of the incorporators of the Union Society (1786); and his name is also closely associated with the early history of free-masonry in the United States. After the Revolution Sheftall was one of the foremost reorganizers of the Savannah congregation; and he was largely instrumental in securing the first enclosed Jewish burial-ground in that city. The records of Congress show that Sheftall subsequently made efforts to recover some of the money he had advanced to the American cause. The documents connected with this case are quite numerous; but, though the claim was favorably reported, the money has not been paid to the heirs. Son of Mordecai Sheftall; born in Savannah Oct. 12, 1796. He practised as a physician in his native town and was elected twice to the state legislature. He was also a judge of the county court. Son of Mordecai Sheftall; captured by the British while acting as deputy commissioner in the Revolutionary war and sent as prisoner to the West Indies. Cyrus Adler, in Menorah Monthly, vii. 253-257.